The Noah’s Ark Charity Welsh 3,000s Challenge is a walk, climb and scramble to the peak of all 15 of Snowdonia’s mountains measuring over 3,000 feet. Over the course of a Saturday and Sunday in June, our experienced mountain guides will take you on a 31 mile trek through some of the most striking scenery Britain has to offer. But be under no illusion, this Snowdonia National Park adventure is no walk in the park. The route takes two full days to complete and includes long and steep inclines. 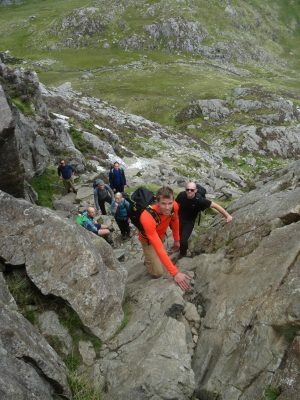 There are also several scrambling sections, including the famous Crib Goch Ridge, the highest point of which stands 923 meters above sea level. The Welsh 3,000s is an ideal adventure to take on as a group of friends, family or colleagues. But whether you’re with people you already know or flying solo, there’ll be no going it alone. Our friendly and experienced guides are skilled at whipping up an atmosphere which will get you thinking as a team in no time. travel to and from your start and end points each day. The price does not include food which you will need to bring yourselves or travel to and from Snowdonia. Participants are asked to raise £300 in sponsorship which will go directly to supporting the 73,000 children treated at the Noah’s Ark Children’s Hospital for Wales in 2017.